The eye is 1 inch in diameter and is located in the anterior portion of the orbit. The orbit is the bony structure of the skull that surrounds the eye and offers protection to the eye. The choroid is the dark brown membrane located between the sclera and the retina that has dark pigmentation to prevent light from reflecting internally. The choroid lines most of the sclera and is attached to the retina but can detach easily from the sclera. The choroid contains many blood vessels and supplies nutrients to the retina. The ciliary body connects the choroid with the iris and secretes aqueous humor that helps give the eye its shape; the muscles of the ciliary body control the thickness of the lens. The iris is the colored portion of the eye, located in front of the lens, and it has a centralcircular opening called the pupil. The pupil controls the amount of light admitted into the retina (darkness produces dilation and light produces constriction). 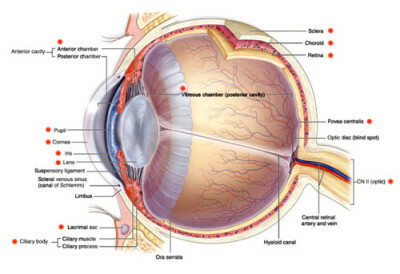 The retina is bordered externally by the choroid and sclera and internally by the vitreous. The retina is the visual receptive layer of the eye in which light waves are changed into nerve impulses; it contains blood vessels and photoreceptors called rods and cones. The vitreous body transmits light and gives shape to the posterior eye. Rods are responsible for peripheral vision and function at reduced levels of illumination. Cones function at bright levels of illumination and are responsible for color vision and central vision. The optic disc is a creamy pink to white depressed area in the retina. The optic nerve enters and exits the eyeball at this area. This area is called the blind spot because it contains only nerve fibers, lacks photoreceptor cells, and is insensitive to light. The central depressed part of the macula is the fovea centralis, the area of sharpest and keenest vision, where most acute vision occurs. The aqueous humor is a clear watery fluid that fills the anterior and posterior chambers of the eye. The aqueous humor is produced by the ciliary processes, and the fluid drains into the canal of Schlemm. The anterior chamber lies between the cornea and the iris. The posterior chamber lies between the iris and the lens. Canal of Schlemm: Passageway that extends completely around the eye; it permits fluid to drain out of the eye into the systemic circulation so a constant intraocular pressure is maintained. The lens bends rays of light so that the light falls on the retina. The curve of the lens changes to focus on near or distant objects. The lacrimal gland produces tears. Tears are drained through the punctum into the lacrimal duct and sac. Muscles do not work independently but work with the muscle that produces the opposite movement. Rectus muscles exert their pull when the eye turns temporally. Oblique muscles exert their pull when the eye turns nasally. The ophthalmic artery is the major artery supplying the structures in the eye. The ophthalmic veins drain the blood from the eye.